Explore the Multnomah Falls, Columbia Gorge, Visit Hood River and see Mt Hood and Timberline lodge where the Shinning was filmed. 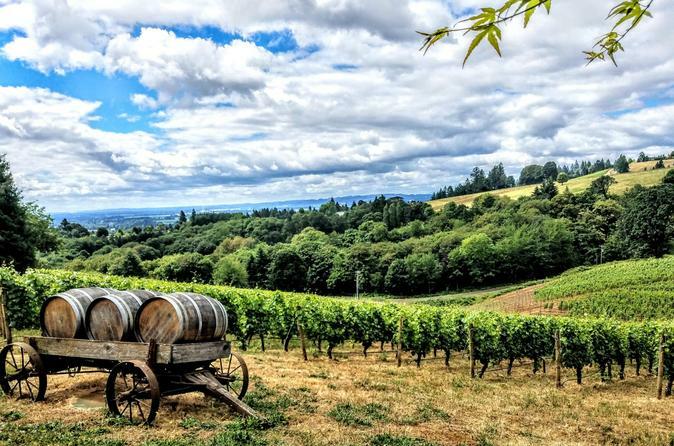 On the second day embark on a wine tour in the Willamette Valley where you can taste the best Pinot Noir, Pinot Gris and other favorite varietals like our local rose and chardonnays. Visit he most popular tours in Oregon, why settle on one attraction, have the whole 2 days to be wowed by immersing yourself in Oregon and everything it has to offer conveniently in one package. View the activity details for full tour breakdown. Booking requires only one person and up to 4 people can go. Explore the breathtaking Multnomah Falls, Hood River, Mt Hood and experience the Columbia Gorge. This can be either a wine tour, nature tour or both. 7-8 hour tour. Explore Oregon's wine country known as the Willamette Valley and experience the best Pinot Noir, Pinot Gris and other varietals guided by local wine lovers who have worked along top winemakers in the region. Gain an inside perspective about the growing region, the winemaking process and the history of this valley. Expect to be pampered, entertained, and truly have a memorable trip in Oregon's Wine Country. Your vineyard tour guide can accommodate all of your requests, allowing guests to stick to our route or go with the flow, bend the rules, feel like its "your vocation" and really have a memorable time in this beautiful wine country. Looking forward to making your trip a lasting memory.